Seedlings tolerate light frosts. Established plants may rebloom in late autumn if protected from damaging hard freezes. Peas, Carrot, Cucumber, Asparagus, Lettuce and Tomato. Spring salad vegetables. 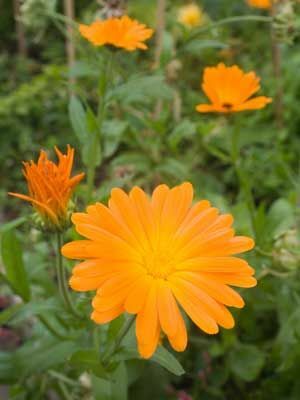 Calendula blossoms are edible and can be used to bring orange colour to rice or potato dishes, or snip them onto soups or salads for extra flavour and nutrition. Use clean scissors to snip off petal tips, and compost the rest.